A collaborative study between Tokyo Institute of Technology (Tokyo Tech) and the University of Tokyo reports a series of green fluorescent protein-based glucose indicators that will aid investigations of energy metabolism in living cells. Named Green Glifons, these indicators are the first of their kind designed to be suitable for live imaging of mammalian cells and for simultaneous imaging alongside other color indicators. The Green Glifons (green glucose-indicating fluorescent proteins), are exquisitely sensitive to different concentrations of glucose, an essential source of energy for cell growth, proliferation and survival. In their study published in the journal Analytical Chemistry, researchers including Tetsuya Kitaguchi of Tokyo Institute of Technology's Laboratory for Chemistry and Life Science showed that the sensors achieved up to a seven-fold increase in fluorescent brightness in response to glucose. They say that their achievement expands the toolkit for monitoring glucose dynamics, enabling cell biologists to visualize many molecules in particular cells of interest at the same time. "Many scientists would like to image multiple molecules in the same cells using different color indicators in order to study their spatial and temporal interaction," Kitaguchi says. "That's why we need sensors that can be easily applied to multicolor imaging." Based on their accumulated expertise in biosensor design and development, the team created three types of Glifons capable of visualizing a useful range of glucose concentrations, from hundreds of micromolar to tens of millimolar concentrations. Named Green Glifon50, Green Glifon600 and Green Glifon4000, the three sensors have EC50 values of 50 μM, 600 μM and 4,000 μM respectively. The researchers demonstrated that all three Glifons can be applied to visualize glucose in different parts of the cell such as the cytoplasm, nucleus and mitochondria of live HeLa cells. They also confirmed that their sensors are suitable for dual color imaging. 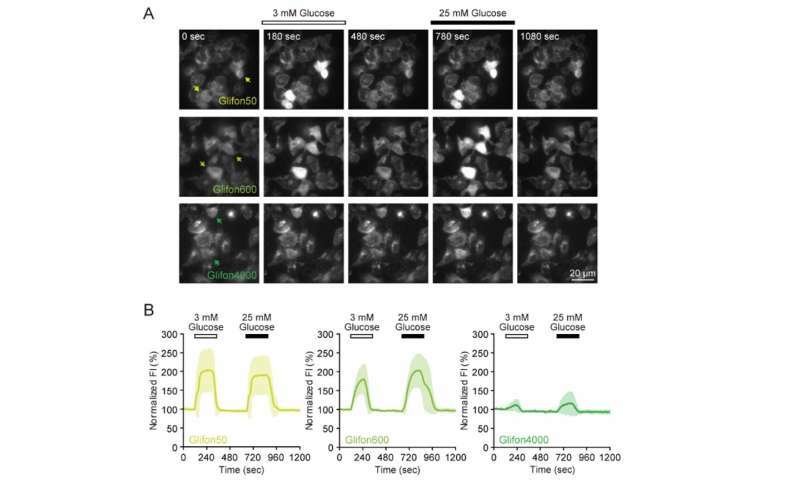 Tests using mouse pancreatic beta cells revealed that Green Glifons can be easily used to visualize glucose alongside the red fluorescent calcium indicator, Rhod-2. To verify whether Glifons are suitable for real-time live cell imaging, they conducted experiments using the roundworm Caenorhabditis elegans as an animal model. They succeeded in observing an increase in fluorescence intensity of Green Glifon4000 in the pharyngeal muscle positioned in the worm's throat. The current study builds on Kitaguchi and his colleagues' work on many kinds of biosensors, which they have colorfully named after birds and mythical beasts. "For sensors of second messengers, we decided to name after birds: Flamindo and cGull. And for sensors of metabolism, we named after chimera: MaLion and Glifon," explains Kitaguchi. He says that all of the knowledge gained so far has been invaluable for optimizing the structure of Glifons. "For example, we realized that linker length within the protein structure is important when we developed Flamindo," he says. "Later, we found that the amino acid sequence in the linker is crucial when we developed cGull and MaLions." Looking ahead, Glifons could help advance understanding of several chronic and lifestyle-related diseases including diabetes and obesity, as they are related to glucose imbalance. Many research groups are now investigating how artificial sweeteners, for example, might disturb glucose metabolism. Much remains to be explored, as the health effect of artificial sweeteners is a subject of ongoing debate, says Kitaguchi.